The name comes from native word "Kodacha" or "Kodashi" which means hill of Kutaja flowers(Jasmine) and "Adri" a Sanskrit word, both combined together coined the word Kodachadri. You can easily access this place from Sigandur,Kollur. 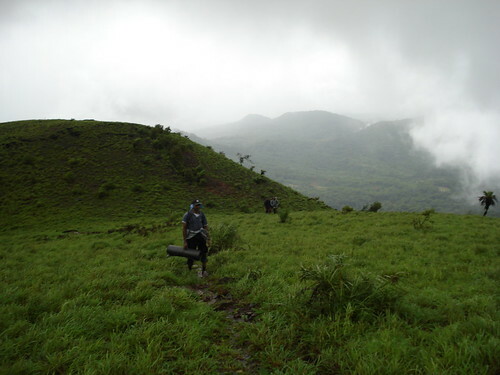 Trekking in Kodachadri can be an adventurous and spiritual experience. The trek starts at the base of the Kodachadri Hill. 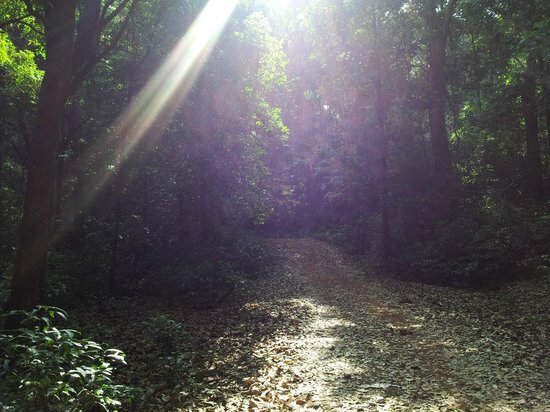 On the way, you will pass the Bhakti Vedantha Eco Village belonging to ISKCON.The trek up to the ancient temple from this point involves a climb of 4 km through thick jungle trails. The Siddheshwara Huliraya Mookambika Temple as this shrine is called, actually consists of two temple complexes. The first temple is dedicated to the terrible, warrior form of the Goddess, with an ancient 7 meter high iron pillar in front. A bit higher up, there is the second temple, dedicated to the calm and beautiful Uma Maheshwari form of the goddess. This temple complex has a small pond and is surrounded by four sacred springs. Trekkers who visit this temple can stay in rooms hired out by the temple priest for a very low charge and food is also provided at reasonable rates. Staying here overnight facilitates easy access to the peak during the early morning hours. An early morning trek to the top, before daybreak, will enable you to witness the breathtaking view of sunrise. On clear days, the view of the surrounding regions and the Arabian Sea from this summit can be an experience to treasure for a lifetime. There is another ancient temple here which is known as Shankara Peetam. For the more adventurous, there is the steep trek down the western side of the hill to reach the holy Chitramoola Cave. It is believed that Sri Adi Shankara sat in meditation here for several days.